Let me start by stating that I enjoy some forms of gambling - I'm a numbers guy, I like the numbers - but I really hate the federal tax treatment of gambling. I think the laws are ridiculous and grossly unfair. Ridiculous because they are nearly impossible for an average taxpayer to comply with. Grossly unfair because...well, that's a long explanation that I'll get to later. Regardless of my personal feelings, however, the laws are the laws and we will always attempt to adhere to them. Gambling winnings of any amount are considered taxable income. If you won $50 in the office Super Bowl squares game you're supposed to pay taxes on it. Gambling winnings of that simplicity are on the honor system, though. There is no paper trail for the IRS to follow, so compliance is very low. Only a fanatically compliant taxpayer would actually consider including that $50 on his or her tax return, but legally they're supposed to. Not only is the casino required to issue you a W-2G, they are also required to deliver a copy to the IRS and withhold either 25% or 28% of your winnings and send that to the IRS as well. 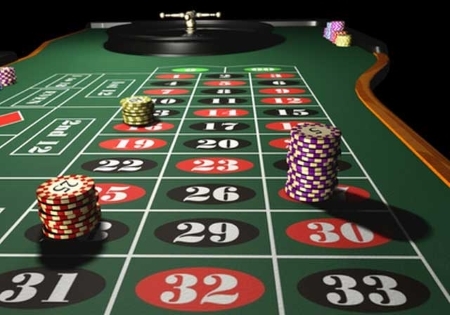 The rules on whether to withhold 25% or 28% are somewhat convoluted, but the casino is never wrong if they withhold 28%, so many default to that amount to be safe. Your gambling winnings go on line 21 of form 1040. If you filed a 1040EZ or a 1040A in the past, congratulations, you have graduated to the form 1040. It is the only form that can accommodate gambling winnings. If you itemize your tax deductions you can deduct gambling losses on schedule A up to the amount of gambling winnings. In other words, if you have $1,000 of gambling winnings and $3,000 of gambling losses you can deduct $1,000 of your gambling losses. You still eat $2,000 of gambling losses without getting any tax benefit, but at least it zeroes out your gambling winnings for tax purposes. Well.... kinda... Let me show you how that isn't 100% true. This is where I explain why I think the tax laws on gambling are grossly unfair. Let's look at an example. This example is exaggerated to make my point, but after reading it you should be able to understand the inherent unfairness of how the law works. John is a school teacher earning $50,000 per year. He drives a Corolla, has a child, contributes $300 per month to his IRA, is working toward his master's degree, and pays his taxes on time every year. John also visits a local casino every night and bets $1,000 on a single hand of blackjack. That's it, one bet, $1,000, every night, 365 days a year. In 2015 John won 182 times and lost 183 times for a net loss of $1,000 for the year. Model citizen John includes $182,000 (his 182 wins) as income on line 21 of his form 1040 and deducts $182,000 on schedule A (the maximum he can deduct up to his winnings). John's adjusted gross income (AGI) for the year is now $232,000 (his gambling winnings plus his teacher's salary). At that AGI his contributions to his IRA are no longer tax deductible, increasing his tax bill by $900 given his 25% top marginal rate. He no longer qualifies for the child tax credit, costing him another $1,000. He no longer qualifies for the lifetime learning credit for his college expenses, costing him up to $2,000. He may even owe Alternative Minimum Tax. John's $182,000 deduction for gambling losses peaks the interest of the friendly neighborhood IRS agent, who decides to audit John. Does John have records and/or receipts for his gambling losses? Probably not. Most people who gamble recreationally don't bother. Why would you? You're just having a bit of fun, not running a business. But John better hope he can prove he lost $182,000 at the casino, or his gambling deduction could be disallowed and then he is in for a ton of taxes due. John's net gambling losses for the year were $1,000, and the tax code beats the hell out of him for it. That is why I believe the tax laws on gambling are grossly unfair. You can't net your wins and losses for the year on your tax return. You have to claim all your wins as income and then deduct the losses later on the form. That approach can wreck someone's tax situation. When it comes to gambling, it's like Uncle Sam is your silent mafia partner. If you win you pay him his cut. If you lose he can get it out of you in other ways. 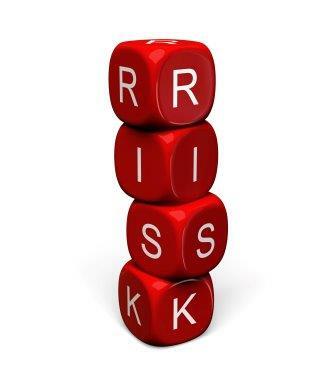 If you do a fair amount of recreational gambling it is prudent to keep a good record of your wins and losses. If you ever hit a big payout you will want to be able to substantiate the deduction for losses you'll take on schedule A to offset your winnings. If you have questions about taxes and gambling please contact me. Tom left his wife Wilma in May 2015 and moved in with his pregnant girlfriend Greta. Tom and Wilma have a 3-year-old daughter who remains with Wilma in the house where they previously all lived together. Tom is not providing any support to Wilma or their daughter. Greta gives birth to a boy in November. Legal proceedings for Tom and Wilma's divorce have not yet started. What is Tom's filing status for his 2015 tax return? What about Wilma and Greta? How should they file? These are tricky situations. No one complains more than I do about the complexity of the tax code, but in some ways it has to be complex. It must cover every US Taxpayer - and there will be some unusual situations in the mix. Situations that don't fit the typical pattern or original intent of the law. Yet, the law must be interpreted to cover every one of those situations, even Tom and his children and their mothers and their living arrangements. In this situation there are several legal ways for Tom to file, so we want to use the one that would be most advantageous. You will often hear me say Legal and Most Advantageous, which I also abbreviate as LAMA. Based on our knowledge of the situation thus far his options may include Married Filing Jointly (MFJ), Married Filing Separately (MFS), Single, and Head of Household (HoH). There might be some additional circumstances that prevent Tom from using one or more of those filing statuses, so we need to explore them a bit further. Tom and Wilma could file Married Filing Jointly, and this may well be their most advantageous filing status. While filing this way might be advantageous with respect to minimizing their tax burden, filing jointly would require a degree of cooperation between Tom and Wilma that may not exist. Tom can't file jointly if Wilma refuses. Likewise, Wilma can't file jointly if Tom refuses. They would need to agree to do it, and share information to get their tax return completed. They might cooperate if they are shown that it saves them money, but in situations like these it is not uncommon for people to forgo their most advantageous filing status to avoid cooperating with a soon-to-be ex. Emotion has been known to trump logic in such matters. Tom's filing status could be Married Filing Separately. This may seem like the most logical way for Tom to file, since he is married and he is separated from his spouse. However, it is probably also the least advantageous way for him to file (but we don't yet know for sure). Remarkably, it could still require a small degree of cooperation between Tom and Wilma. When a married couple elects to file separately they must both claim their tax deductions in the same manner - meaning they must both itemize on schedule A OR they must both claim the standard deduction for married filing separately. In order to know how your spouse claimed deductions you have to ask them. Tom could also file as single. He can be considered unmarried as he did not live with his spouse for the last 6 months of the year. State marriage laws may come into play here. If the state has a process for being legally separated it must be used. (Virginia does not have such a provision.) Filing singly is less advantageous than filing as HoH, so Tom would only use this filing status if Greta is claiming their son on her taxes. To find the most advantageous filing status solution Tom should calculate his taxes all of the different ways and compare the results. In the above scenario I would expect the most advantageous filing status would be for Tom and Wilma to file jointly and Greta to file as Head of Household (assuming all other criteria are met), but I wouldn't know for sure until I had run the numbers through my software every possible way. That can be tedious and time consuming, but might be worth the effort. If you have questions about your filing status, please feel free to contact me. I am writing this post because I have seen several clients who have formed a business partnership without knowing there were tax filing implications for doing so. I am not trying to dissuade anyone from forming a partnership, but I think it would be helpful for people to know how that is going to impact their tax return preparation. OK, let me get this disclaimer out of the way: I am not a lawyer. I don't give legal advice, and this blog post is not meant to be legal advice. This post isn't even tax advice. This post is meant to educate taxpayers on the tax ramifications of forming a partnership. A partnership can be formed in several ways, but the one that seems to surprise the most people in my experience is when they form a Limited Liability Company (LLC) together. Limited Liability Companies have become very popular for the protection against personal liability they extend to small business owners. LLCs are organized under state laws, and many states - including Virginia - have made them relatively easy and affordable to form. A simple scenario might be one in which Jim and John are friends and generally handy do-it-yourselfers. John has a truck, they both have some tools, and they decide to try to make a little money on the side by doing simple repair work at people's residences. They form an LLC to limit their liability, listing both Jim and John as members of the LLC. In the eyes of the IRS they have just formed a partnership. Why do Jim and John care that they have just formed a partnership? Because partnerships are required to file a separate federal income tax return - the Form 1065, US Return of Partnership Income. Like most states, Virginia also requires partnerships to file a separate tax return - Form 502, Pass Through Entity Return of Income. Don't misunderstand - Jim and John's partnership does not have to pay any tax. 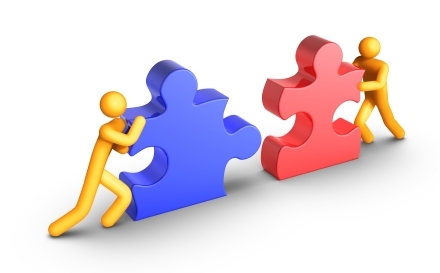 A partnership is a pass through entity - all of the profits and losses are passed through to the partners. Jim and John will pay the taxes for the partnership through their individual income tax returns. BUT, the partnership must file the 1065 return so the IRS has a record of the profits and losses that were passed through to each partner. The process works as indicated in the diagram below. The partnership files form 1065. 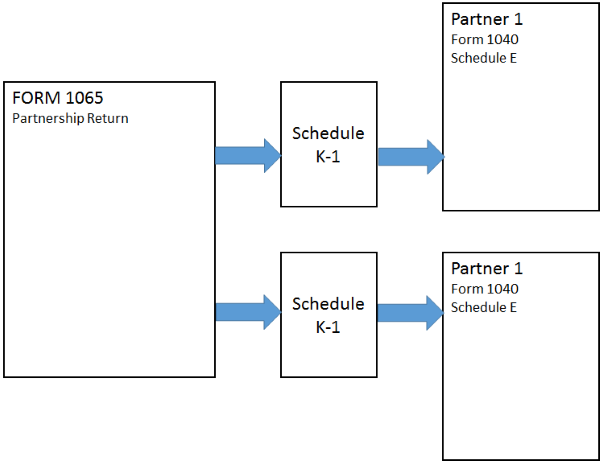 At the time the 1065 is created Schedule K-1s are created for each of the partners. The K-1 contains the information about each individual partner's income and expenses from the partnership. Each partner would use the Schedule K-1 issued by the partnership when preparing his or her individual income tax return. The information from the K-1 generally gets placed on Schedule E of form 1040 of the individual return. Partnership tax returns are generally more complex than individual income tax returns. While Jim and John have a very simple partnership, the same tax form also has to be able to handle a partnership between Berkshire Hathaway (an American corporation) and Fiat (a foreign corporation). That partnership does not exist, but those two corporations could form a partnership, and if they did the partnership would have to file a form 1065. To further complicate things, income on an individual tax return (form 1040) falls into different categories for tax purposes. For example, long term capital gains are taxed differently than wages. Those two types of income have different character. Because the income from the partnership is passing through to the individual partners, it is important for the character of income to be preserved. Long term capital gains from a partnership must pass to the partners as long term capital gains. Rents as rents, etc. In order for this to happen some of the income items on a form 1065 must be separately stated. This can make the Form 1065 a real pain in the neck to figure out. In addition to the complexity of the return, the software to create the 1065 isn't cheap, either. 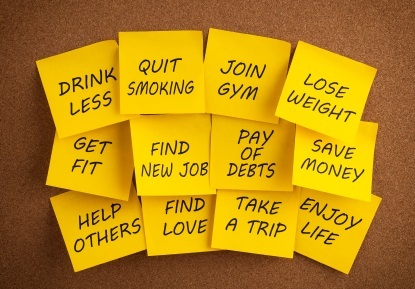 There are some significant hassles for do-it-yourselfers. I'm not saying a small business owner couldn't figure out how to prepare and file his or her own Form 1065, but Jim and John would probably benefit from some professional assistance. Is there a way to get out of filing a partnership return? Well, there's this: You file a form 8832 and have your partnership declared a corporation. You might have some very good reasons for doing this, but simplifying your tax situation is not one of them. Corporations file their own separate tax return and some of them also have to pay their own taxes. You wouldn't reclassify your partnership as a corporation as a method of streamlining your tax paperwork, because you will very likely have more paperwork with a corporation than with a partnership. Partnerships and LLCs are some great tools for small business owners. Just be sure your eyes are open about the tax consequences if you form one. You are going to have to file some additional tax forms. If you have questions please contact me. The short answer from me is to hang onto that form 1095 (A/B/C) because you might need it to prove to the IRS you don't owe a penalty tax! You probably don't need it to file your taxes (although some people will), but it might just save you a heap of trouble one day if the IRS comes knocking. Now I'm going to try to explain this beast in single blog post. No small feat given the complexity. 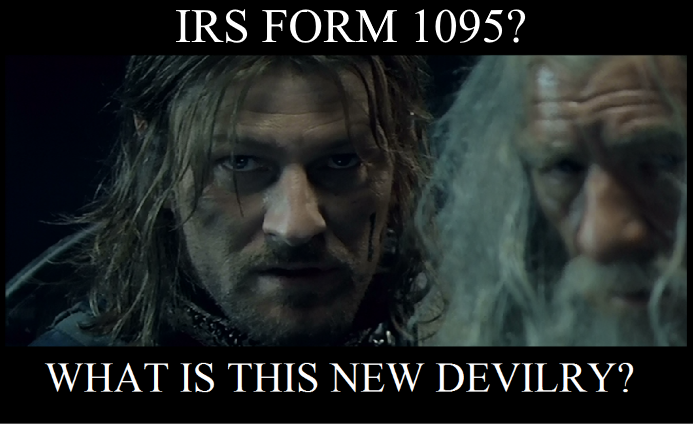 The 1095 series (A/B/C) are new tax forms this year. (Actually, the 1095-A debuted last year.) The 1095 series is related to the Affordable Care Act (ACA) (you know...that government policy people either love or hate... sometimes known as "ObamaCare"). It's a little misleading that the 1095 gets sent to you, because it's not really for YOU. It's for the IRS. As you are (hopefully) aware, the ACA requires all Americans to have health care insurance or pay a penalty tax. The form 1095 is sent by employers or insurers to the IRS, and tells the IRS who had health care insurance in 2015. The copy sent to you is mostly for information purposes, although those with a 1095-A will probably need it to prepare their tax return. The flavor of 1095 you receive (A, B, or C) depends on how you acquired your health care insurance. 1095-A: If you received your health care insurance via the online marketplace/exchange, then you get a 1095-A. If you are eligible for the Premium Tax Credit, then you will need your 1095-A in order to correctly calculate your taxes. (In reality, it would be possible to get health care insurance through the exchange and calculate your taxes without the 1095-A, but if you can do that you should be writing a tax blog, not reading one!) The Premium Tax Credit is government assistance to purchase health care insurance. Eligibility for the Premium Tax Credit is based on income and family size. I could write paragraphs on this topic, but I won't because the immediate issue isn't the 1095-A. That came out last year. This year the new and concerning issue is the 1095-Bs and Cs. 1095-B: You get a 1095-B if you get your health care insurance through the government or directly from an insurance company (meaning you bought a policy directly from an insurer without going through your employer or the exchange). 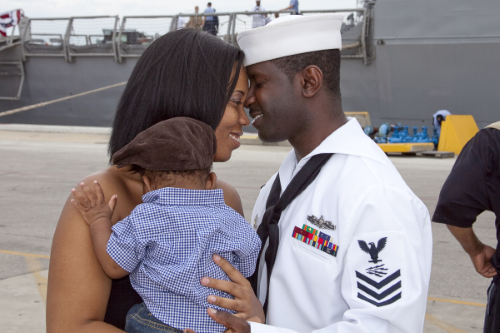 Military personnel and their families covered by TriCare should receive a form 1095-B. Veteran's receiving their health care insurance through the Veteran's Administration should also receive a form 1095-B. 1095-C: If you work for an employer with 50 or more full-time employees, the employer is now required to provide an affordable health care insurance plan to their employees or pay a penalty tax. There have been lots of news stories of late about what constitutes an employer with 50 employees, and what constitutes full-time employment. I could also write paragraphs about that, but lets assume you work for one of the majority of Applicable Large Employers who will simply comply with the law. You will receive a form 1095-C.
Taxpayers receiving a form 1095-A should receive their forms by 1 FEB.
Those of us receiving a form 1095-B or C might not get it until 31 March. This is the first year employers have to provide this form, so the government gave them an extension this year to get the forms out to employees. Many people are getting them now (my 1095-Bs from the VA and DoD are already received), but employers have the extension this year so they will probably continue to trickle out for most of tax season. In the future employers have until 1 FEB to send the forms to taxpayers (and the IRS). You don't need to wait until you have your 1095-B or C to file your tax return. You might want to, but you don't need to. The only reason I can think to wait for your 1095-B or C is because you can't remember which months you had insurance due to non-continuous employment or coverage. In that case you may want to wait to make sure your tax return information matches the information provided to the IRS on form 1095-B or C. You really want that to match. The IRS will likely have questions for you if it doesn't. Remember - the purpose of this form is to have employers and insurers tell the government who had (or was at least offered) health care insurance in 2015. The government is essentially using employers and insurers to help them police individual compliance with the mandate to have health care insurance. Any month that you or your dependents were not insured generates a tax penalty. Last year you could just say you had health care insurance. This year you have to prove it. You do not send a copy of the form 1095 as part of your income tax return. However, I would verify the form 1095-B/C you received is correct, and keep a copy for 7 years. You want to have your documentation in order if the IRS comes knocking. The ACA penalty tax is large and growing. You want to be able to prove you don't owe it, and that 1095-B/C stating you had coverage all year is your ticket to prove you were covered. Keep track of it. There are still ways to get exempted from the requirement to have health care insurance. If you think you might qualify for an exemption or you have additional questions, please contact me. 'You don't know what you don't' know was a commonly used expression in my former career as a Navy Intelligence Officer. It carried two different meanings. Sometimes it meant never stop researching the adversary. Other times it meant we have intelligence not everyone can be told. Either way, I don't think the expression was as useful in that line of work as it is in tax preparation. Most people who seek professional assistance with their taxes do so because they are afraid of what they do not know. They fear they will leave something critical off of their tax return causing them to underpay their taxes and landing them in hot water with the IRS. They also fear they will be unaware of a tax break they qualify for and will pay more in taxes than they need to. The peace of mind they get from having a professional prepare their taxes is worth the cost of the service. They don't know what they don't know, but they expect the professional will know. I would say that is usually true, but not always. There are, unfortunately, some inexperienced and under-educated tax preparers out there. My first year as a preparer I frequently worked alone in the shop with another first year preparer. We were the only two available to work the evening shift, so it was just us most evenings. Customers had no idea we didn't have a very broad base of tax knowledge or experience. They assumed (reasonably so, I think) that the nationally known company for which we worked would never leave two newbies alone in the store during tax season. So, you don't know what you don't know extends beyond knowledge of taxes, but also to the knowledge, credentials, and experience of your tax preparer. Does that person across the desk actually know what they are doing? Remarkably, only one customer that entire year ever asked me about my credentials or experience. I was a little stunned when she asked (probably because of the way she threw it at me like an accusation), but I think it is a very reasonable question. - If your taxes can be filed on a 1040EZ or a 1040A, anyone will do. Seriously. In fact, you should probably just do them yourself. - If you file a plain old form 1040 you probably want someone with at least a year's worth of experience. - If you file a 1040 with a Schedule C, E, F, or H, you want someone with at least 3 year's experience. Preferably someone with the Enrolled Agent (EA) credential. - If you are filing something other than an individual tax return, such as a form 1041, 706, 709, 990, 1065, or 1120, you want an EA or a CPA. In retrospect I am glad I worked alongside another new preparer my first tax season. I was forced to deal with some more complex tax issues than I would have been if paired with a senior tax preparer. I was forced to learn at a faster rate. It was good for my growth as a tax professional. It worked out well for me that most of my clients didn't know what they didn't know. That doesn't make it right, of course, but it worked out. I am an Enrolled Agent, federally licensed and regulated by the IRS to prepare taxes and represent taxpayers at any office within the IRS. If you want professional assistance with your tax return, please contact me. Last week I discussed the Military Spouse Residency Relief Act and how Virginia applies it. Virginia has some additional tax laws specific to military personnel, and I thought this would be a good time to run through those. 1. If you are military, but not a resident of Virginia, you do not have to pay income tax on your military pay or on interest earned from deposits in Virginia banks. However, if you have income attributable to Virginia sources - like an extra part-time job or income from a rental property - this is taxable in Virginia. Virginia is not unique in this regard. Most states will tax the non-military income of military members. One Navy Petty Officer I know had inherited an IRA during the year. She cashed out the entire amount, which was just about equal to what the Navy was paying her for the year. Her home state, Missouri, didn't tax her military pay, but they wanted a piece of that IRA distribution. She wasn't very happy when she found that out, which is why I always encourage people to contact a tax professional whenever something unusual is happening with their finances. It could save you a bundle. 3. The wages of O-3 and below serving in the Virginia National Guard are exempt from Virginia income taxes (up to $3,000). 4. If you are stationed outside the US when your Virginia return is due (1 May), then you are automatically granted an extension until 1 July. 5. Remember - if one spouse is a Virginia resident and the other is not, then the resident of Virginia should file their Virginia return as "Married Filing Separately" even if their Federal tax return was file "Married Filing Jointly". This is for Virginia residents, only. Not all states handle the situation of spouses being from different states the same way. If you are doing your own taxes you will need to research the states where you file. If you would like some assistance with your taxes, please contact me or schedule an appointment!. The states with income taxes (currently 44 of them) do not have uniform rules for their treatment of military personnel. They are all different to one degree or another. Many service members find the state treatment of taxes confusing. You shouldn't find it alarming if you do. I study taxes and I find it difficult to understand some of the different rules. They use words like resident, non-resident, and domicile, and they sometimes don't mean the same thing from one state's laws to the next. When it comes to state taxes, I deal most frequently with Virginia. Fortunately, I find the Virginia instructions easier to understand than most of the other states. Virginia taxes income somewhat aggressively (fewer deductions), but at least you don't need a law degree to understand the instructions on their website. The biggest concern military families face when living in Virginia are the residency laws. I'll try to explain Virginia's residency treatment of military personnel as succinctly as possible. Residency: In Virginia you are classified as either a resident or a non-resident. Residents pay taxes. You can live here and not be a resident. If you are in the military it depends on your official "Home of Record". Usually this is the state you were living in when you joined, unless you changed it at some point. When I first joined my home of record was my home state - Ohio. When I was stationed in Florida I changed my home of record to Florida (one of the states with no income tax). Then I moved to Virginia, but I remained a Florida resident until I retired from active duty. The Soldiers and Sailors Civil Relief Act prevents the states from automatically making military personnel residents and taxing them. Military spouses are a little trickier. When we first moved here in 2001 my wife was considered a Virginia resident as soon as she was employed. Although we were married in Florida and she was a Florida resident when we moved, she was not covered by the Soldiers and Sailors Civil Relief Act. Things have changed since Tade and I moved here. In 2009 Congress passed the Military Spouses Residency Relief Act. Under those rules Tade would have remained a Florida resident. 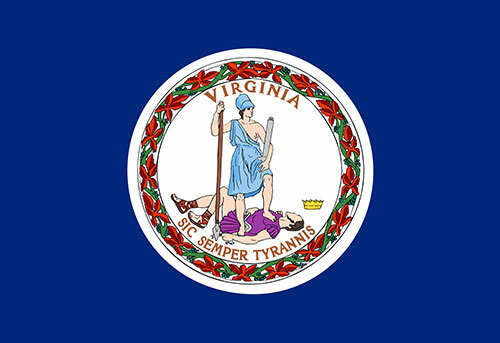 Under Virginia law, as long as the spouse has the same legal state of residence as the service member, they are considered non-residents and do not pay Virginia state income taxes. Note that caveat - must have the same state of residence as the military member. If I kept Ohio as my Home of Record, married Tade in Florida and moved her to Virginia, she would not be protected by the Military Spouses Residency Relief Act. Since she was not an Ohio resident she would become a tax-paying Virginian. It is typically more advantageous for married persons to use the married filing jointly (MFJ) filing status on their federal tax return. When one spouse must pay income taxes in Virginia and the other does not the most advantageous way to file the Virginia return is to use the married filing separately (MFS) filing status. AS I have previously written, most tax software does not like it much when you file your federal and state returns using different filing statuses. Many people run into problems with that scenario - and, frankly, it isn't even terribly complex. Consider this couple. A sailor from Florida gets stationed in Illinois. While there he marries an Illinois resident. Then they PCS to Virginia. She owns a house in Illinois, which she rents out while they are living in Virginia. She gets a job in Virginia. Because she does not have the same state of residence as her husband Virginia considers her a Virginia resident, and Virginia state income taxes are withheld from her pay. Husband owes no state income taxes, but wife owes state taxes in both Virginia and Illinois (for the rental income). They file their federal taxes MFJ. She files a Virginia return MFS. Illinois law also allows MFS filing for spouses that file MFJ federally (http://www.revenue.state.il.us/Publications/Pubs/Pub-102.pdf). That was one of those returns that takes quite a while to prepare because of the intricacies of the state tax laws and the inflexibility of the software. If you have a return like that, bring it to me, we'll figure it out. It is Resolution Season, that magical time when we pick something we want to accomplish in the coming year and take a solemn vow to make it happen. Solemn being in the eye of the beholder, of course. Most of our pasts are littered with abandoned resolutions. Tade has actually been keeping a record of our New Year's resolutions for the past couple of decades. She has a small book for just that purpose. She breaks it out somewhere between December 27 and January 2 and we review resolutions from previous years. Then we make this year's resolutions and she dutifully records them for posterity. Like many Americans, most of my previous resolutions have had something to do with becoming healthier and taking better care of myself. Sometimes my resolutions are general - I will exercise more. Sometimes they are specific - I will go to the gym 3 times per week this year. Usually they are abandoned by February, which is why I must make the same resolutions over and over again. Looking back, the years where I did best at sticking to my physical fitness resolutions were the years I had someone to workout with. Someone who knew, or even shared, my fitness goals. Someone who knew things about fitness I did not know, and we could discuss techniques. Someone who would note even small amounts of my progress. Someone who would know when I wasn't sticking to my plan. Someone keeping me motivated and accountable. There's just something about having a partner that makes doing the hard things easier. Many people resolve themselves (at this time of year) to get their personal finances in order. Just like most other resolutions it gets abandoned by February. Change is hard. Perhaps if people had a partner helping them with their personal finance goals they would be more likely to stick to them. Someone to discuss strategies and techniques. Someone to note small amounts of progress. Someone to provide accountability. One of my favorite things to do is to help other people reach their financial goals. If you would like to start to work towards yours this year, you should contact me. I will be your partner. It is the Giving Season. 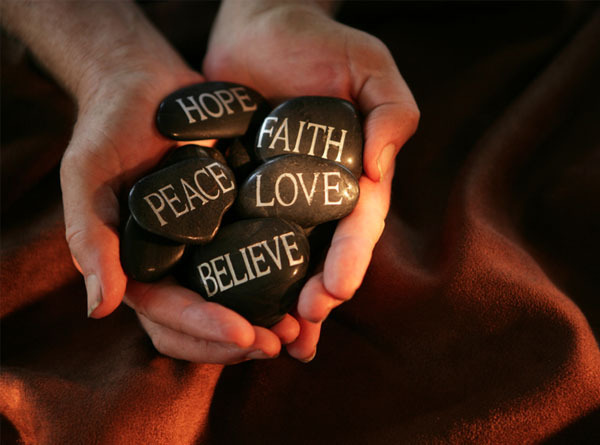 That time of year when we open our hearts and our wallets to our families, friends, and communities. A situation brought on by both the holidays and the realization that the tax year is nearly over and we are running out of time to make a tax deductible charitable contribution. I know what the Christmas bills came to and I can balance my books. While I have a ballpark figure of how much I am going to donate in a given year I like to make sure Tade and I didn't overdo it at Christmas before I commit the money. I like the security of knowing the check is going to clear before I send it. I have a clearer picture of our overall tax situation at the end of the year. With children in college there is some question about who is going on my return and who is filing their own return. Also, as a small business owner my revenue for the year can be a mystery until the very end.I prefer having clarity on my taxsituation before I donate. Lots of businesses do matching donations this time of year. Always nice to get my favorite charities some extra money by making a donation at a time when someone else will double it. Receipts or other written records of the donation (credit card statement, cancelled check) showing the amount donated, the date, and the name of the charity. If you give property in lieu of cash you can deduct the fair market value at the time of the donation. If the property is valued at over $500 you may need to obtain an independent appraisal of the property. You are not required to include these receipts and other records with your tax return, but you are required to produce them for review if the IRS audits your income tax return. It is often advantageous for taxpayers to donate appreciated property instead of cash. Imagine for a minute that you have some ABC stock worth $2,000. You originally paid $1,000 for the ABC stock, but it has appreciated and is now worth $2,000. You would like to make a $2,000 contribution to your favorite charity. You can donate the stock or you could just give them cash. If you donate the cash you can deduct the $2,000 from your taxes. If you donate the ABC stock you can also deduct the fair market value of the stock - $2,000. However, by donating the stock you also avoid paying the capital gains taxes on the $1,000 of capital gain on the stock when you sell it. For most people the capital gains rate (long term) is 15%. Donating the stock instead of cash saved you an extra $150 in taxes. It's a great time of year for charitable giving. If you want some assistance figuring out the best way for you to be more effective with your charitable donations, please contact me.